My meager pot of tomato plants has finished producing and been cut back to a few stalks jutting from the dark soil they’ve been planted in since May, waiting for me to pull them up. But I’m lucky to have friends whose plants are still producing and thankfully willing to share. The challenge for me at times is knowing what to do with them because my own plants have rarely produced more than what we can eat in a salad. Often my timing is bad in being able to enjoy the lot — just how many tomatoes can two people eat at one sitting, right? Especially when my husband forgets to bring them home right away and they’re, well, soft. Into the freezer they go — stems and all. I put them on a metal tray until they’re hard as rocks, then pour them into a plastic bag for later use. Last year I managed to save a bag until mid-February when it was a welcome addition to a hearty tomato squash soup. This year, I’ve already used one frozen bag, but still have two more in the freezer and will enjoy deciding what to make with them. I’ll have to blame my need to use some of my frozen homegrown tomato stash on this Irish Blue Cheese and Tomato Soup recipe from Soup Chick. I’m a pushover to begin with because I love tomato soup, but I’ve never had it with blue cheese — let alone bacon. I was completely intrigued, so of course I had to try it. I had the tomatoes, but the recipe requires that they are roasted. 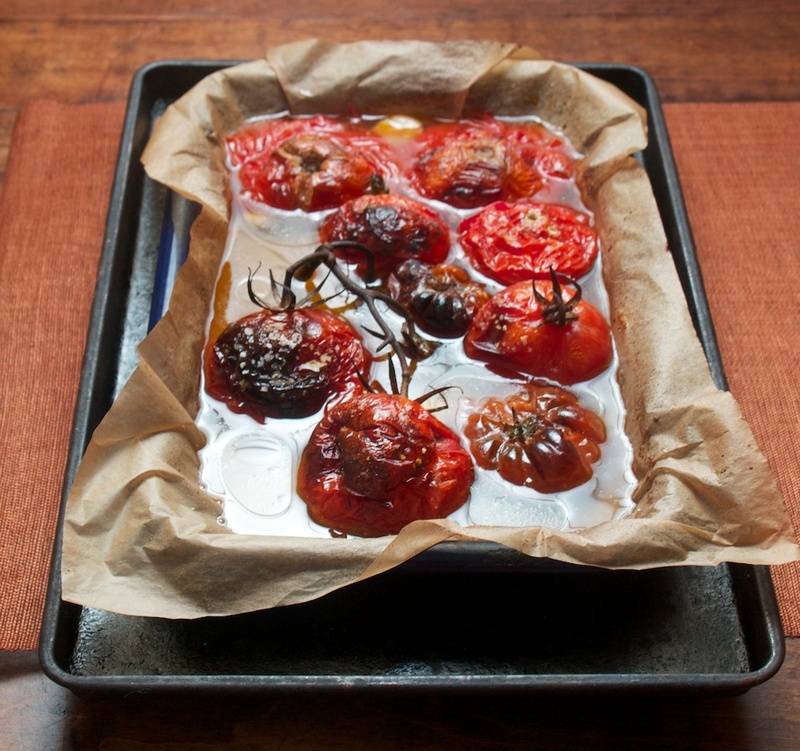 Roasting isn’t a problem because I’ve roasted tomatoes several different ways and truly enjoy the flavor. 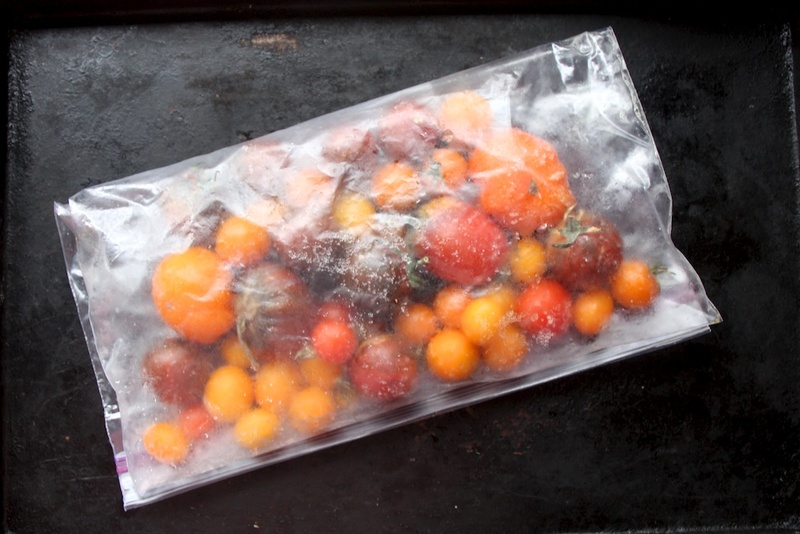 However I’d never roasted thawed, frozen tomatoes. I love a good food experiment, don’t you? Especially when the result is such a satisfyingly, tasty soup. 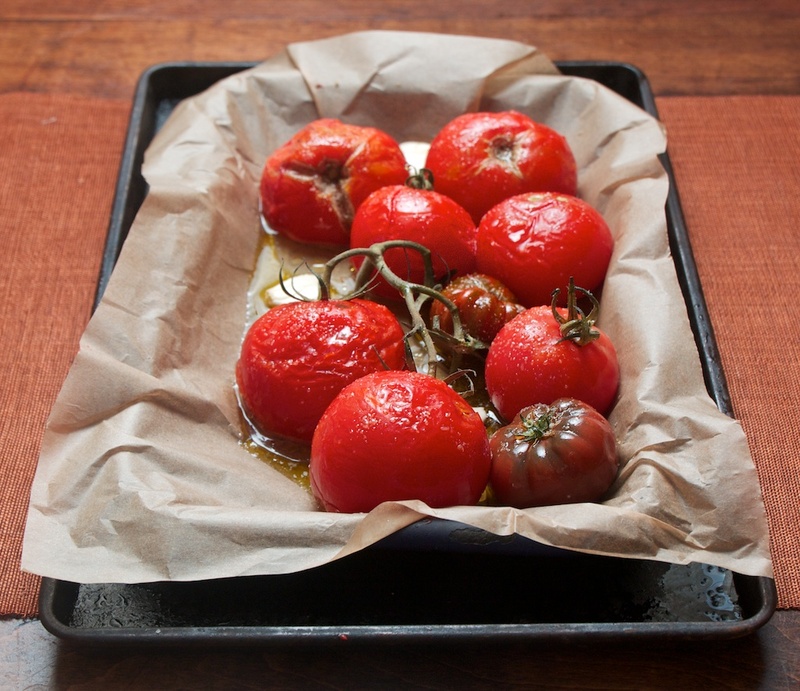 Place whole tomatoes on a rimmed baking sheet covered with parchment and drizzle olive oil over. Smash the cloves of garlic with the side of a large knife, peel them and add them to the tomatoes. Sprinkle with a bit of salt and pepper. Roast at 425 degrees F for 25-30 minutes. 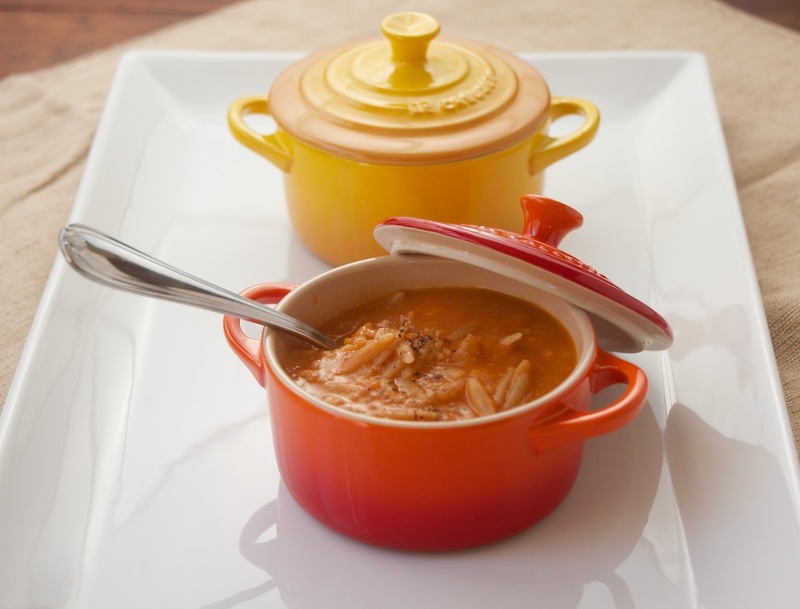 While the tomatoes are roasting, if you plan to add the orzo to the soup, prepare that now according to package directions — al dente. Remove from the oven and allow to cool enough to touch. 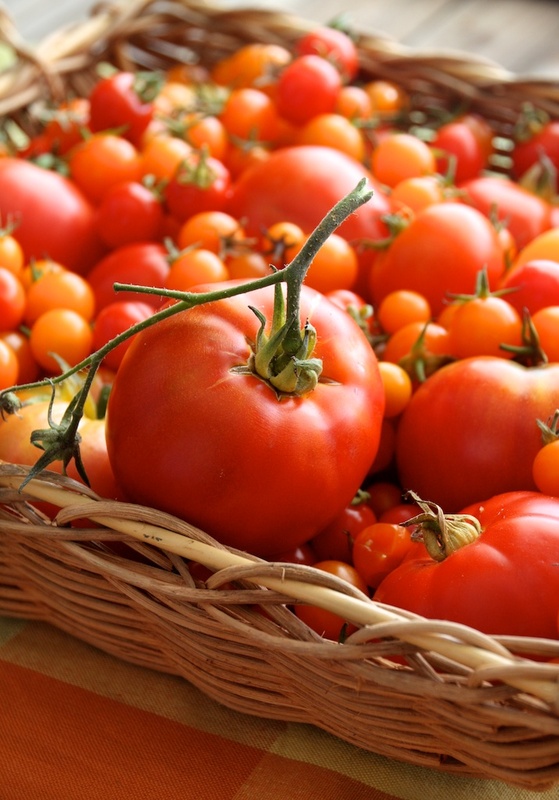 If time is short, pour the tomatoes and their juice into a wide shallow bowl to quicken the cooling process. 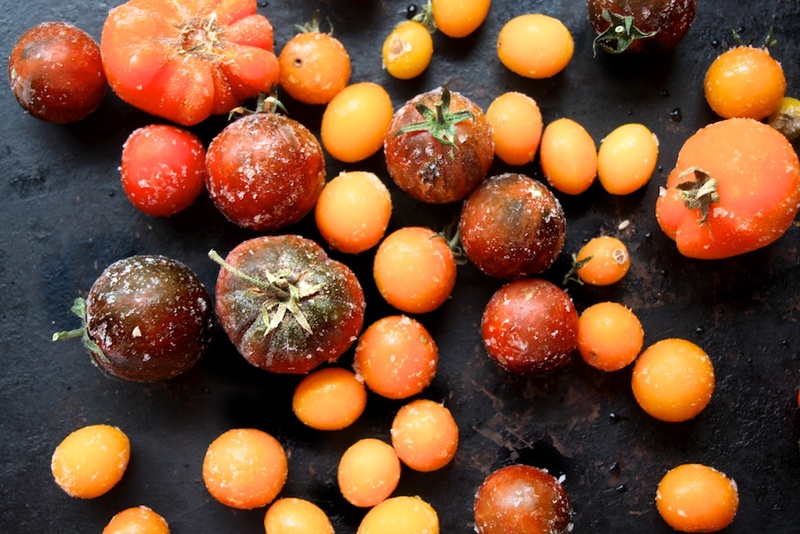 When the tomatoes are cool, remove stems and skin and discard. In a large pot, add the bacon and cook over medium high heat until the fat is rendered and the bacon is just beginning to brown around the edges. Remove the bacon pieces and place them in a small bowl to reserve. Reduce the heat to medium low and add the onion, celery, and bell pepper. Allow to cook, stirring occasionally, just until softened, about 5 minutes. Sprinkle the flour over the vegetables, stirring to incorporate, and allow to cook 1-2 minutes. Stir the heated vegetable broth over the vegetables, stirring to scrape up any browned bits on the bottom of the pan. Allow to cook just until it begins to thicken, about 5 minutes. Add the tomatoes and their juices, continuing to cook until the soup reaches a simmer. Crumble the blue cheese over the soup and stir until melted. If desired, use an immersion blender, blender, or food processor to puree the soup. Pour in the milk and allow it to heat briefly, about 1 minute. Stir in the the cooked orzo if including it in the recipe, then add the bacon pieces, reserving a few to garnish. The smaller yellow and orange tomatoes weren’t used in this recipe, but they could have been. I just wanted to show you how I do just pop them in the freezer. The first photo was taken earlier this past summer after I returned home from picking my dear friend’s tomatoes while she was on vacation. Lucky me! The second two were the last of my crop from last year which I gathered in mid-October right before we went on vacation. Amazing how my growing season was so much longer last year! As usual when I’m inspired by a great recipe, I often don’t have exactly the same ingredients on hand. In the case of this soup, I was lacking the carrots, but had the bell pepper, and although they’re both orange, of course that’s not why I made the substitution. Both add a sweetness to the mix and if you consider the holy trinity of gumbo bases (onion, celery, and bell pepper), I knew I would be in the ball park. I had milk but not cream, found I was out of chicken broth so used veggie, and then only a partial package of blue cheese — about half the required quantity. And you know the story about the tomatoes from what I mentioned above. About those tomatoes: My goodness they released quite a bit of water during the roasting — definitely more than what I’ve noticed when roasting fresh tomatoes. They end up being quite soft, but the good thing is, the skins are completely separated from the flesh, so you can pull them right out of the mix simply by using a fork to poke around in it. There’s no need to chop them, because they’re already so soft. We truly enjoyed the flavors in this soup, and because we’re blue-veined cheese lovers, I have to make it again using the required amount of cheese. I used a mild blue-veined Brie for this recipe and it was a perfect choice. Nice an creamy. Why the whole wheat orzo? I had it on hand for another meal and decided to add it the next day when I was enjoying a bowl of left-over soup for lunch. 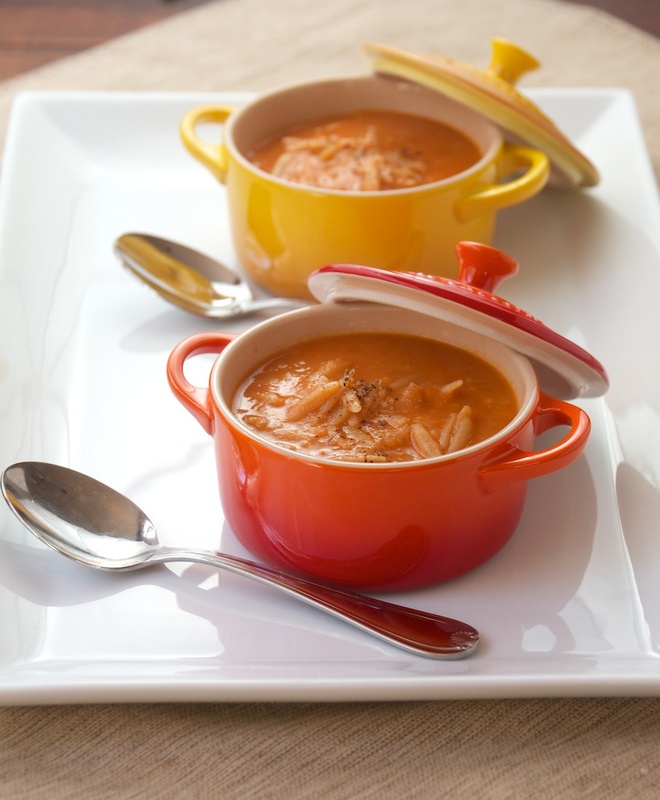 I was remembering a favorite tomato rice soup recipe and thought it might be similar. It was a great addition, but the soup is excellent without it as well. Many thanks to Lydia who also writes The Perfect Pantry, for sharing such a great recipe.